Behold, Star Wars made entirely out of scarecrows. 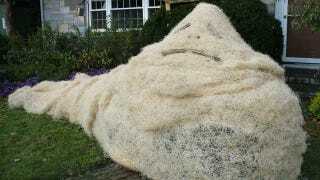 This glorious Halloween lawn paid special attention to each straw-stuffed detail. Check out the Emperor's lightning hands, Han's belt, the glowing lightsabers, and the Death Star. Truly this is the best Halloween lawn on the planet. These photos were taken by Jesusshuttlesworth34 — we salute you straw rebels, droids and Jedis! Also, there's no word on the internet as to where this glorious lawn is located. If anyone knows where this masterpiece lives, please let us know! RECENT AND RELATED: Luke Skywalker discovers Jesus.